It is our first time to Kyoto and we wanted to find a good guide to show us around. We searched and found Nobu-San and the fantastic experiences he brought to his customers. We booked our private tour with him and he arrived very early with his well-maintained and comfortable van. We didn’t have a specific itinerary in mind, Nobu- San was very friendly and patient, he asked us many questions to understand us better and brought us to some of Kyoto’s most fascinating sites. Nobu-San is very professional and knowledgeable and he shared a lot about the history of all the sites we visited. We learnt so much and were amazed by the history and beauty of Kyoto. Nobu-San is also resourceful and accommodating, we wanted to visit a sake brewery which is exclusive to Kyoto, he was able to arrange for a visit to a local yet established sake brewery at a very short notice where we had awesome sake tasting and sharing session with the owner of the brewery. We had an enjoyable time and purchased our favorite sake from the brewery. We would highly recommend to engage Nobu-San when you come to Kyoto and would definitely have another tour with him when we come back to Kyoto! 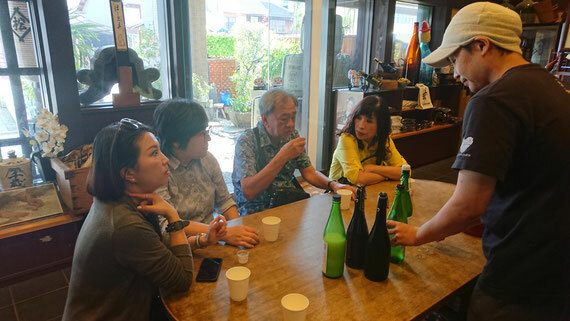 The tasting of the japanese sake in Matsu Shuzo, started in 1726.